''Note to non-wiki readers: This documentation is generated from the Eclipse wiki - if you have corrections or additions it would be awesome if you added them in [http://wiki.eclipse.org/Zest the original wiki page]''. Documentation on Zest - The Eclipse Visualization Framework. For general information visit the [http://www.eclipse.org/gef/zest Zest home page]. Documentation on getting started with Zest 1.x, the latest released version of Zest, can be found on the [[GEF_Zest_Visualization|Zest 1.x wiki page]]. Further documentation is available under the [http://wiki.eclipse.org/Category:GEF GEF category]. Documentation on getting started with Zest 1.x, the latest released version of Zest, can be found in the [[GEF/Reference_Documentation|GEF Reference Documentation]]. This is a collection of documentation on Zest 2.0, the latest development version of Zest. The complete sample usage is [http://git.eclipse.org/c/gef/org.eclipse.gef4.git/tree/org.eclipse.gef4.zest.tests/src/org/eclipse/gef4/zest/tests/dot/TestDotGraph.java available in the repository], as well as [http://git.eclipse.org/c/gef/org.eclipse.gef4.git/tree/org.eclipse.gef4.zest.tests/resources/tests DOT input samples]. Using the API, DOT can be imported to Zest graphs, and Zest graphs can be exported to DOT (see below). 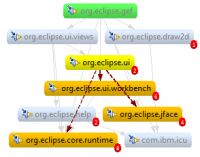 To use the API, create a new Plug-in project and add ''org.eclipse.zest.dot.core'' to the MANIFEST.MF dependencies. In Zest 2, the layout API has been reworked. See the Javadoc of the deprecated API for documentation on migrating to the new API. The major API change is a rename of the central Graph class to GraphWidget. Graph is a new UI independent data structure in the GEF4 Graph component. GraphWidgets can be created from these Graph objects (see code in the DOT API section above). Documentation on getting started with Zest 1.x, the latest released version of Zest, can be found in the GEF Reference Documentation.